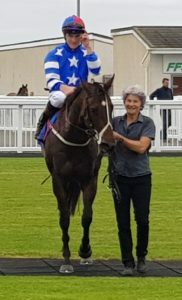 A couple of runners today at Salisbury with SWEET PURSUIT (pictured) making a quick return having finished an unlucky second at Goodwood on Tuesday. Has had a couple of runs at Ffos Las and showed more on his second start but as a son of Champs Elysees he will come into his own next season and should make up into a nice three-year-old handicapper. Tough Pastoral Pursuits filly who is having an excellent season, racking up a Ffos Las hat-trick before being unlucky on her last two starts. She should have won on Tuesday, but she half missed the kick which left her badly placed in a slowly run race before flying home inside the final furlong to finish second. She is out again 48hrs later but when there are only six runners with £22,000 on offer you need to take a chance when a horse is fit and well. The negatives would be the stronger grade and quicker ground, however, you can never rule out a filly in form and she shouldn’t be too far away.